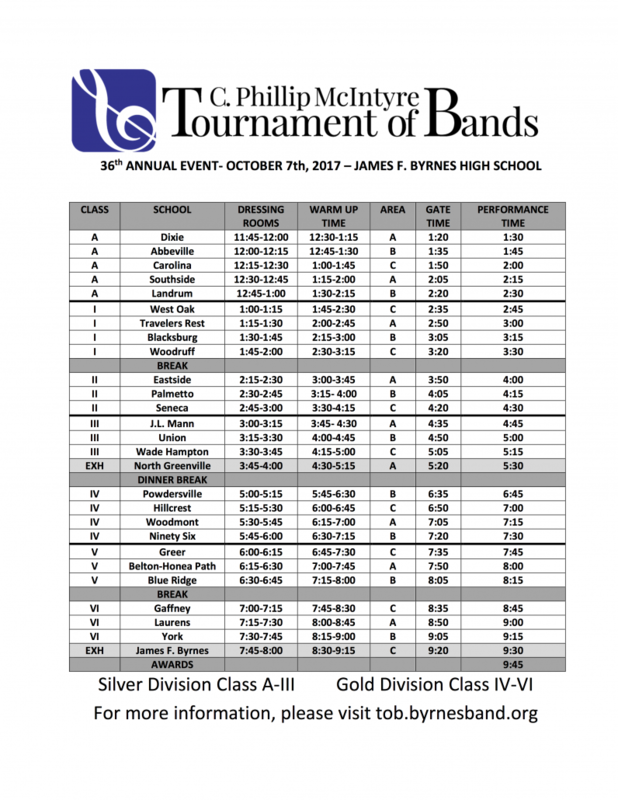 When is the C. Phillip McIntyre Tournament of Bands? How much are admissions prices? Admission is $10 adult, $8 seniors/students (with proper ID) for this event. This is a full day pass and everyone will receive a wristband upon entering. This will allow spectators to exit and re-enter if necessary. Children 4 and under are free! What is the address to the venue? Programs will be available for sale the day of competition for $5 each. How many bands will be participating? Please see our 2017 Schedule below. Will there be free parking available? 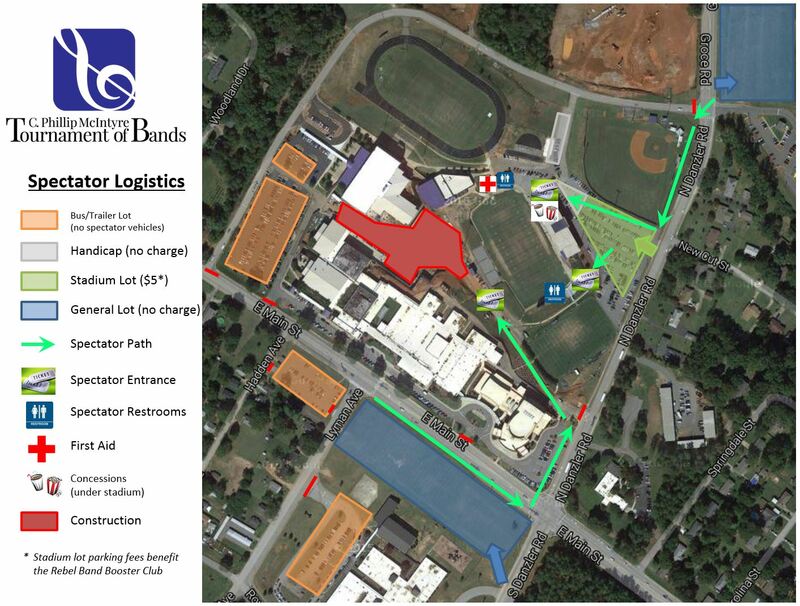 Free parking is available across the street (SC 290) from the high school in the field at Duncan Elementary School or in the field across from the baseball field. Spectator vehicles may not follow the buses into the parking lot. Cars and other personal vehicles should park in designated spectator lots. Premium spectator parking is available at the stadium for a cost of $5. Handicapped parking is available at the stadium at no cost. Most of the seating in the spacious stadium is concrete bench. There are a number of stadium seats with backs. See the Nixon Field page for photos. Will there be concessions available? Yes. We will have concessions available. We will offer hamburgers, chicken fingers and sandwiches, french fries, pizza, hot dogs, nachos, chili cheese fries, sodas, water, and candy. We will also have vendors on site with additional items. We will only accept cash at our ticket booth and concessions stand. ATMs will be available on site for use. Who are the judges for 2018? Don’t See the Answer, Submit Your Question!